Be A GMA SHRM Star! Spotlights: Is Compensation your Calling? Fingers crossed, spring has finally sprung! We look forward to celebrating with you at our 2018 Human Capital Conference. Registration is still open and I encourage you to register today if you haven’t already. David Horsager is our keynote speaker this year and as always, we have several fantastic breakout sessions, opportunities to meet our partners and sponsors for the day, a networking hour (with food!) and door prizes. We’ll also again have silent auction items this year to benefit the SHRM Foundation – so many opportunities to win a prize! I know summer is a busy time for all of us, but wanted to share some upcoming communications and events that you can take advantage of, while hopefully having some time away from work to enjoy the summer! Late May – our new Board of Directors slate will be emailed out to our membership for formal vote and approval. Each year, we solicit nominations for new board members to join the board and are looking forward to welcoming new members and continuing with many current board members. Look for the slate to land in your in-box later this month! Early June – our annual member survey. This is another opportunity for you to help us shape our 2019 programming, with topics and speaker suggestions and give input in a few other areas of the chapter. In addition, you can enter to win 1 of 5 gift cards valued at $25, just for completing the survey! 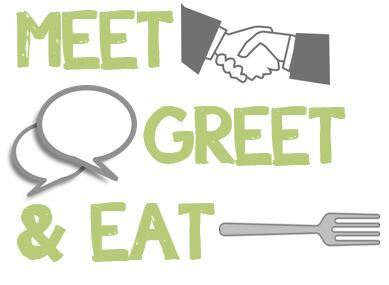 June 14 – our first “Meet, Greet & Eat” will be held at Waypoint Public House for a lunch event. This is a less structured event and a great opportunity to share stories, eat lunch and meet fellow GMA Members. Learn more and RSVP to attend here. June 17 – 20 is the SHRM Annual Conference and Exposition. This year, it’s held in Chicago – hopefully some of you will have the opportunity to attend. Our Roundtable discussions continue throughout the summer. These are monthly discussions to address HR topics that are top of mind to you and your company, brainstorm on a new idea you may have to implement or hear from other GMA Members. If you haven’t attended one yet, I encourage you to attend one this summer to take advantage of this fantastic benefit! The August PDS is open for registration! The topics will focus on “Evidence-Based Human Resource Management” and “Understanding Advanced Issues in FMLA Administration”. Both will be great topics and I encourage you to sign-up early to attend! I look forward to seeing you at an upcoming event and as always, if you do have any questions or feedback on our chapter, please feel free to reach out to me directly. On March 3, 2018, Revenue Procedure 2018-18 reduced the maximum Health Savings Account (HSA) contribution for taxpayers with family coverage under a High Deductible Health Plan (HDHP) to $6,850 annually, from $6,900. This was due to a change in the inflation adjustment calculations for 2018 under the Tax Cuts and Jobs Act. There was no change to the maximum contribution amount for taxpayers with single coverage and that amount remains at $3,450 annually. On April 26, 2018, the Internal Revenue Service announced it will allow the previous maximum amount of $6,900 annually for family HSA contributions. Employers will want to make sure to update their procedures and policies accordingly. The Tax Cuts and Jobs Act of 2017 and Section 45S of the Internal Revenue Code enable employers to claim a business tax credit in years 2018 and 2019 for paid family and medical leave that they provide to employees under certain circumstances. The tax credit applies to employers of all sizes and even to those who are not subject to the Family and Medical Leave Act (“FMLA”). Wages that are at least 50% of what the employee normally earns. For 2018, the credit is available for employees who earned $72,000 or less in 2017. Any qualifying exigency resulting from the employee’s spouse, child or parent being on covered active military duty (or having been notified of an impending call or order to covered active military duty). The credit will range from 12.5% to 25% of the cost of each hour of paid leave, depending on how much of an employee’s regular earnings are replaced by the employer’s leave benefit. For example, if an employer pays an employee $40,000 in wages, which includes $5,000 of paid FMLA leave for which the employer received a credit of $1,250, the employer can only deduct $38,750 of the wage expense. In the FAQs, the IRS also indicated that it expects to issue additional future guidance that will address when a written leave policy must be in place, how paid “family and medical leave” relates to an employer’s other paid leave, how to determine if an employee has been employed for “one year or more,” the impact of State and local leave requirements, and whether members of a controlled group of businesses should be treated as a single taxpayer in determining the tax credit. 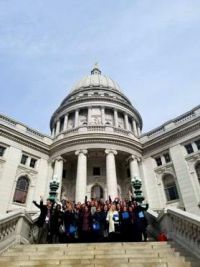 For the 4th consecutive year, the Wisconsin State Council of the Society of Human Resource Management (WISHRM) has organized one of the premier human resources legislative and advocacy events in the nation, WISHRM Day on the Hill in Wisconsin’s state capitol city, Madison, Wisconsin. Planning and hosting an event of this nature takes months of advance work and could not be done successfully without the work of a team of dedicated SHRM volunteers committing their time and talents as part of a “Day on the Hill” planning committee. WISHRM has been fortunate to have a hard-working committee led by WISHRM Legislative Director, Elise Rommes, and WISHRM Government Affairs Director, Tony Renning, as well as a number of committee members from local SHRM chapters all across Wisconsin. Along with in-state resources, WISHRM also relies on the expertise of Meredith Nethercutt, Senior Associate for Member Advocacy at SHRM. 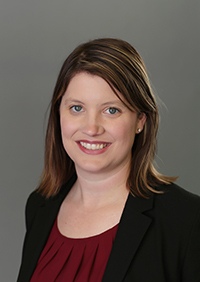 In addition to supporting us with best practices from other states and updates from DC, Meredith also works with the offices of our state legislators in scheduling the multitude of meetings that take place during the afternoon visit to the Wisconsin State Capitol for advocacy meetings. This year, Meredith also prepared our attendees by facilitating a pre-conference webinar one week before the event. Attendees were provided with information about advocacy best practices, how to conduct a meeting with elected officials, and information about SHRM’s advocacy efforts. Tony Renning also offered an overview of the legislative issues that attendees would be advocating in support of on behalf of WISHRM. An evening reception was held the day before the Day on the Hill to provide an opportunity for attendees to network with each other and prepare for the next day events in a casual, social environment. Several attendees also chose to take a brief tour of the Wisconsin State Capitol and were able to view the Wisconsin State Assembly in session from the Assembly Gallery. 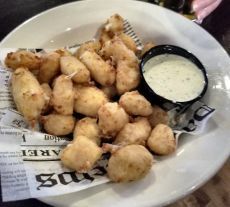 The highlight of the evening for many was the “post reception” to partake in a Wisconsin delicacy, the famous deep fried cheese curds, made with locally crafted Wisconsin cheese! Our event day began bright and early at 8:00am with a special welcome message. I had the honor of reading a welcome letter to our attendees from Wisconsin Governor Scott Walker. 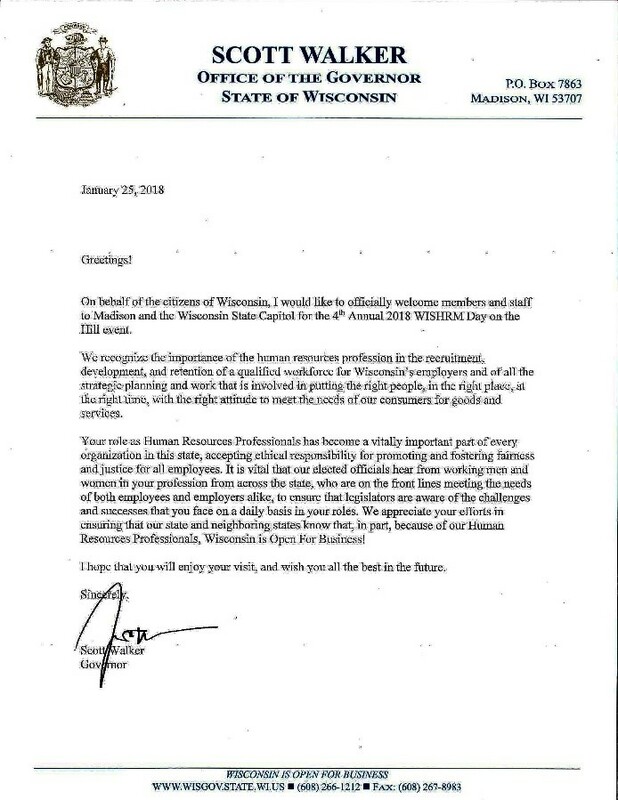 In his letter, Governor Walker recognized the importance of the human resources profession and our critical role in the future growth and development of the growing Wisconsin economy. Meredith Nethercutt then provided an informative update, highlighting the many accomplishments of the SHRM Advocacy Team (A-Team) in 2017. These accomplishments included: “reach outs” by policy makers, invitations to congressional and state roundtables, and member testimony before congressional, federal agency and state committees. Attendees were also given an overview of the SHRM A-Team, and how our collective HR voices can make a difference at all levels of government through member advocacy. A legislative update from Chris Reader, Director of Health & Human Resources Policy at Wisconsin Manufacturers and Commerce (WMC) regarding the issues that we would be advocating for in legislative meetings. Legal updates and the “strangest employment cases of the year” from Attorney Bob Gregg of Boardman & Clark Law Firm and WISHRM Legislative Partner. A ‘How a Bill Becomes a Law” session (for those of you seasoned HR professionals, think “Schoolhouse Rock”, and yes, we did play the video…) conducted by Attorney Tony Renning, WISHRM Government Affairs Director. An Affordable Care Act (ACA) update by Susan Sieger, Senior Compliance Consultant with Employee Benefits Corporation. A behind the scenes look at the Wisconsin State Capitol presented by Jessie Opoien of the Capital Times Press Corps. After the final presentation, the majority of the attendees gathered for the short walk from our conference hotel, across the street to the Wisconsin State Capitol for our pre-scheduled meetings with legislators. With the Wisconsin State Assembly in session, representatives were on the Assembly Floor throughout the afternoon but several members took time out to meet with our advocates personally to acknowledge our advocacy issues. Some attendees met with legislative staff to provide information to be shared with the legislator. Overall, the efforts of our Wisconsin SHRM advocates have made a positive impact upon the legislative process. Several of the issues that were discussed in previous sessions have moved forward and the annual visits and ongoing dialogue with the elected officials has strengthened the relationship between our Wisconsin SHRM members and their elected officials. For those SHRM members across the country that have not participated in a similar “Day on the Hill” in your state, I strongly encourage you to do so. While it may be a different and unique experience from other human resources professional development opportunities, it is one that can help to open new insights to an element of our profession that can be often overlooked. Each year we have a mix of new attendees as well as those that return each year. Their experiences have helped our members to learn more about the lawmaking process and provided them with the knowledge and confidence to make their collective voices heard on issues that are important to our employers, employees and the overall human resources profession. NOTE: The 5th Annual WISHRM Day on the Hill is tentatively being planned for February, 2019. More information will be provided when available. GMA SHRM is excited to announce David Horsager as our keynote presenter in 2018! David Horsager, MA, CSP, CPAE is the CEO of Trust Edge Leadership Institute, national bestselling author of The Trust Edge, inventor of the Enterprise Trust Index™, and director of one of the nation’s foremost trust studies: The Trust Outlook™. His work has been featured in prominent publications such as Fast Company, Forbes, The Huffington Post and The Wall Street Journal. David has advised leaders and delivered life-changing presentations on six continents, with audiences ranging everywhere from FedEx, Toyota and global governments to the New York Yankees and the Department of Homeland Security. Click the image at right to view a video invitation from David! Along with outstanding keynotes and the great networking our conference is known for, we will feature 9 breakout sessions from industry experts including special presentations from Lieutenant Commander Chip Lutz, USN(Ret), MSEd, CSP! Breakout topics will include Building Political Acumen for Human Resource Professionals, Say Hello to Exit Interviews, Controlling Anger Before It Controls The Team, Using Big Data to Help Win the War for Talent and the latest HR Legal Updates! Our conference regularly draws more than 250 human resource professionals. Trust us, you dont want to miss it! This year, the SHRM Annual Conference is June 17 – 20 and right in our backyard – in Chicago! This is the largest conference for HR professionals and for education, networking and professional development, has no equal. Thousands of HR Professionals attend this conference to hear speakers and topics about employment law and legislation, strategic management, leadership development and global HR, as well as practical tools pertaining to compensation and benefits, talent management and diversity. There truly is something for everyone at this conference. Taking place on the final day of the SHRM Annual Conference, June 20th in Chicago, SHRM is bringing together diverse talent in alliance with a range of key partners, including the Thurgood Marshall College Fund, the Hispanic Alliance for Career Enhancement (HACE) and the National Association of African Americans in Human Resources. Our fair will allow recruiters to connect with top candidates of all levels in a variety of functions and industries. We want to offer you the opportunity to join us and demonstrate your organization’s commitment to the advancement of diversity and inclusion. SHRM’s National Diversity and Inclusion Job Fair offers extraordinary potential to increase your visibility and reputation as an innovator and leader within the HR community while connecting with a range of highly qualified candidates in such fields as finance, marketing/sales, customer service, IT, logistics, HR and many others. Look for Brittany at the SHRM Booth on May 15th to get on camera for GMA SHRM! Find yourself a treasure and help support the SHRM Foundation at this year’s Human Capital Conference! The SHRM Foundation supports the veterans workforce initiative, aging workforce initiatives, certification, academic and professional development scholarships and has a vision to help empower HR professionals by building inclusive organizations. Learn more about this SHRM Foundation here. Silent Auction items will be on display at the conference, and open for bid throughout the day with all bidding closing at 4pm.Top bidders will be announced at the networking reception. This is our second year of adding the silent auction and we are so excited about the items up for bid and grateful for all of our donors! And don’t worry – we still have plenty of door prizes to give out during the networking reception! Thank you to all of you for donating to this year’s silent auction and we look forward to raising money for SHRM Foundation! Looking for a quick GMASHRM event that focuses on meeting members, making connections and trying a new restaurant? Join us for our first Greet, Meet & Eat! Don't miss this opportunity for our GMASHRM members to make connections and build relationships without taking much time from personal or work life. We hope to build on this inaugeral luncheon and create more locations moving forward. Three words – nachos, networking, and Jeopardy. Need we say more? Ok we will. Earlier this month, GMA SHRM’s Revealed event took place at the Coliseum Bar in central Madison. Revealed is a two part event: one part ‘new member orientation’, and one part networking. New members meet the GMA SHRM Board of Directors, learn about all their membership has to offer, and about the different volunteer opportunities. Revealed is not just for new members! All GMA SHRM members are encouraged to attend to network, eat, drink, and be merry. Our Revealed event is one of the many perks of your GMA SHRM membership. The event started off with a lively networking reception, followed by our famous GMA SHRM Jeopardy, lead by our gracious MC and volunteer, Meghan Walsh. All we will say about GMA SHRM Jeopardy is it’s a hoot & participants have a blast! Want to see what it’s all about? Revealed will be held again in Fall of 2018 – watch the newsletter for dates and locations. Did you know that GMASHRM members get a special SHRM membership offer? Save $15 on a new or renewal SHRM membership by 6/30 with promo code State18Q and get access to the HR tools and resources to help you be confident, compliant and current on all things HR. https://membership.shrm.org/?PRODUCT_DISCOUNT_ID=STATE18Q&utm_campaign=membership_Ret. The Compensation Survey Committee is responsible developing, producing and maintaining the GMA Compensation Survey every other year. This information is collected for a unique introspection of job market trends. The goal of the Committee is to provide useful information for organizations to understand the compensation trends of the Madison Area. This past survey there were 174 different job titles that were included in the compensation survey. The Committee is currently researching the job titles to determine the usefulness of the information that was reported out. In 2019, the Committee will submit a call for participation from the members for the next compensation survey. The Committee meets every couple of months, more frequently during the survey deployment. If you are interested in serving on the Compensation Survey Committee, contact Rachel Martin at rachel2.martin@wisconsin.gov or 608-267-5165. ﻿GMA SHRM welcomes the following members who joined our chapter in April 2018! Elana Koyun Care Wisconsin First, Inc.